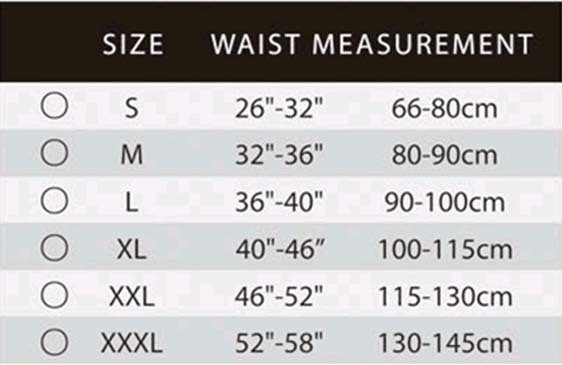 IMPORTANT - Please ensure that your waist measurement is NOT YOUR TROUSERS OR PANTS SIZE, but is the measurement taken with a TAPE MEASURE around the largest part of your abdomenal directly over your navel, (around belly button). Air-traction belt which is developed according to the principle of the traction, can successfully make use of the vertical traction, so that it can realize the continuous traction and support. 1. When the belt is inflated, the width of belt will expand the range from 4.5" /11.5 cm to 7.4"/ 19cm, which provide a strong traction/decompression and protect the waist. 4. The excellent tight material is used in the production, so that the belt is durable and more light. With strong support and light weight, the belt is suitable for wearing during physical exercise, travel, work, housework, driving and effectively protect the waist and relieve the pressure on the lumbar vertebra. IMPORTANT - Please ensure that your Disk Dr order measurement is NOT YOUR TROUSERS OR PANTS SIZE, but is the measurement taken with a TAPE MEASURE around the largest part of your abdomenal directly over your navel. It has been really a delight and pleasant and pleasure to and can really and sincerely say to have made your acquaintance. You sound like a descent honest person, also what comes to my mind is that you pay and did pay attention to details.